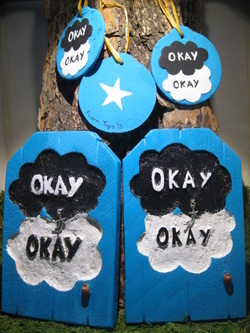 Acorn Tops is now selling Fairy doors and wood ornaments inspired by John Green's The Fault In Our Stars. $5 of every TFIOS inspired items will go to This Star Won't Go Out. It is a foundation established in the memory of Esther Earl to whom the book is dedicated. "This Star Won’t Go Out is making a difference in the lives of children with cancer, one family at a time. By providing funds to help pay for travel, a mortgage or rent check, and other cost of living expenses, TSWGO frees up families to focus on their child who is in treatment. A gift of money is really a gift towards quality time as a family—and that’s a gift that is beyond value. "- Taken from their website. 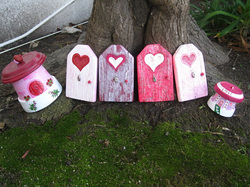 Acorn Tops is now selling Spread the Love fairy doors and fairy houses! $5 of every Spread The Love! Stop the Violence! fairy door and fairy house will go to V-Day! It is a global activist movement that works to end violence against women and girls.